This pretty single storey cottage (shown left of photograph) enjoys a quiet secluded setting just half a mile from St Austell's town centre with its inns, shops and places to eat. 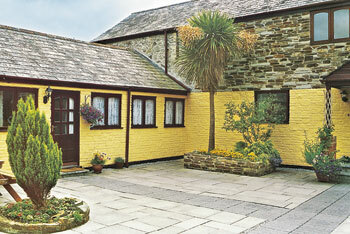 Adjoining the owners' home it is within 3 miles of sandy beaches at Porthpean, Pentewan and Carlyon Bay. Charlestown Heritage Centre, The Lost Gardens of Heligan, (right photograph) the Eden Project and the delightful old fishing port of Mevagissey are all within five miles. A springtime festival honours Daphne du Maurier who set many of her novels in this area. Truro and Lanhydrock (N.T.) are within 15 miles. Three golf courses, cycle hire and riding locally. Two bedrooms. Shared courtyard leads to private entrance. Hall. Very comfortable open plan sitting/dining room with fitted kitchen area. 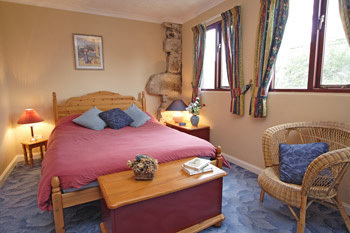 Double bedroom with TV. Bunk bedded room. Bathroom/W.C. (shower over bath).